Amazon Prime Day is here, hooray? It’s Amazon Prime Day, which means only one thing: gratuitous affiliate links from pretty much every blogger you follow including this one some great deals on items that you kinda have to convince yourself you want! Ok so are there actually any good deals or are you just writing a post full of affiliate links to try and make some money from your readers? I’d bet you’re hearing a lot about Prime Day already so I’m just trying to help you sort through the dross to find some good deals instead of having to search through random things like baby cribs when you’re really looking for USB chargers. You have my assurance that I’m posting what I legitimately think are good deals. Maybe not epic or omgtotallyunbefreakinglievable deals but good deals nonetheless. I assure you that I would never betray the trust of my loyal readers for a few bucks here and there from Amazon affiliate links. How about a free 30-day trial? 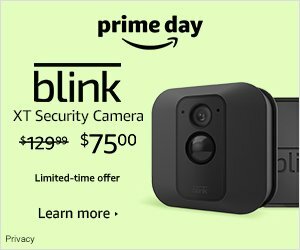 I’ve had Amazon Prime for years and use it for pretty much everything (except camera gear, which I purchase locally from a store I trust, Competitive Cameras in Dallas, Texas). I also love the video options they have, mainly because I love Top Gear and the Grand Tour and they’re both fixtures in the Prime Video library. It’s worth the money to me but try it out for 30 days either way! I’ve purchased two things so far today: the Blink XT home security camera and a couple of Dash buttons. I have quite a bit of camera gear in my condo and, although it’s insured for its full replacement value, I’d love to have an eye on it in case anything were to happen. The Blink XT gets fairly good reviews and is on sale today at a really good price. 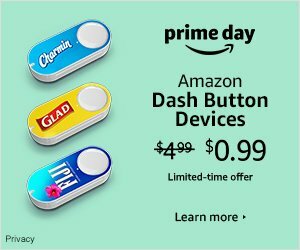 Dash buttons are about the laziest thing about me. Since I’m on the road a lot it’s hard for me to maintain a consistent usage schedule for things like toilet paper and laundry detergent, so I get these little Dash buttons, which allow me to hit a button to order a specific product when I notice I’m getting low on my supply (they’re adhesived to cabinet/pantry doors all around my condo). It’s pure slovenliness, I get that, but these little guys are customizable and super convenient, especially for a buck apiece today. I can always use more memory since I take so many pictures. I have a phalanx of portable USB hard drives which support me at home and on the road but noticed a really good deal for a just-released Seagate 4TB USB hard drive for Prime Day, under $100! If you’re like me and were a sucker for Apple’s crappy stupid loser design and bought a new MacBook Pro with the touch bar and the complete and utter lack of an SD card slot, you probably will want to pick up one of these USB-C hubs. I paid $99 for mine, which has fewer features than this one which is $45 less! I always need power when I’m on the road. My cell phone speeds through its battery quicker than ever and also my Sony cameras can be charged via MicroUSB so I love carrying a USB charger with me. The biggest chargers I’ve seen are the 26800mAh models, which are dense and weigh a bit over a pound but can recharge tons of things. This is the brand I recommend and the price today is a good price. Hopefully this helps point you in the right direction, but what about you? What are you finding on Prime Day? Any deals I missed? Tell me in the comments below!